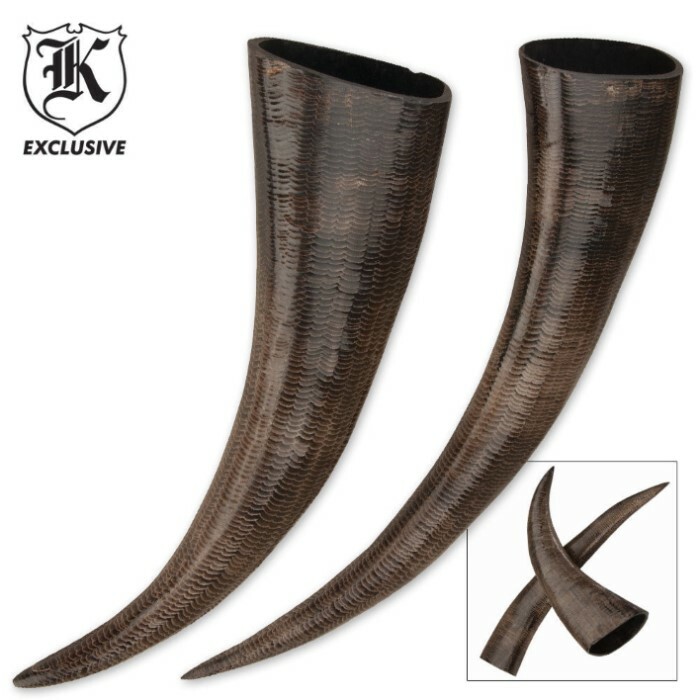 Buffalo Black Drinking Horns 10 Inch Set of 2 | BUDK.com - Knives & Swords At The Lowest Prices! Be the envy of your friends with these authentic black buffalo drinking horns! Each horn features a scale-like texture. Each horn varies slightly. Use for drinking or display; they are sure to be a conversation piece! Buyers at ReenactorFest (Chicao, Illinois) were delighted by the horns and the markings on them, wanting to know whether I had carved the markings myself. When I replied that the markings were natural, their eyes lit up and the ones bought to see if there was a market danced from the shelf! I bought several more as soon as I returned home!